Restaurant stocks in this niche can produce big returns for investors. Here's how to get started looking into stocks in the sector. People love eating out. The average American family spent $3,000 on food away from home in 2014 -- only 25% less cash than they dedicated to groceries -- and by March 2016, spending at restaurants and bars outpaced spending on groceries for the first time ever. It's no surprise then that businesses have rushed to cater to the eating-out demand in a mix of approaches ranging from full-service restaurants to drive-thru-dominated fast-food chains. The fast-casual niche, which combines the best aspects of each of those extremes, has sparked investor enthusiasm due to its recent success at stealing market share in this massive industry. Let's look at the key points to understand before you buy one of these stocks. Fast casual is a segment of the restaurant industry that sits between full-service and fast food. It marries the value and speed elements you might see at a drive-thru burger joint with the high-quality ingredients and labor-heavy preparation methods that you often find in a traditional restaurant. Fast-casual diners typically pay for their meal at a register and enjoy the food on site. The average check is higher than at a fast-food store, but well below what you'd expect to pay at a full-service restaurant. What are the top fast-casual restaurant stocks? Chipotle (NYSE:CMG) is by far the biggest company in this niche. While its expansion pace has been hammered by a recent food-safety scare, the burrito chain's growth suggests there is huge demand for a fast-casual approach. Chipotle now counts over 2,000 locations just six years after going public with less than 500 shops. 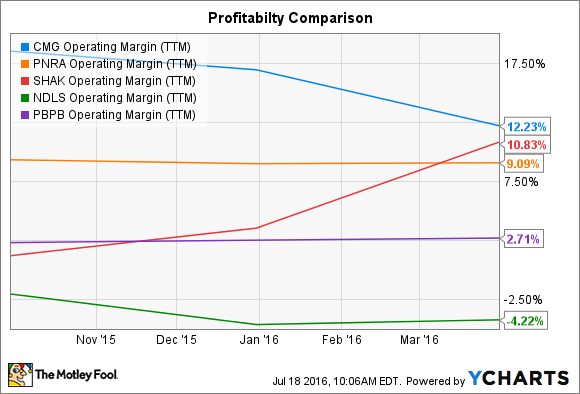 Before the latest slowdown, Chipotle's profit margin was a market-thumping 19% of sales. *Annual sales figures are for the prior 12 months. Data source: Yahoo Finance. Comparable-store sales growth, or comps, describes the health of an established location and so it's one of the most important metrics for investors to watch. It's especially helpful in evaluating a fast-casual business because it separates out the revenue gains from store growth to focus simply on whether a concept is drawing more customers to its locations, and thus improving its restaurant-level economics. Burger chain Shake Shack, for example, expects to boost sales by 30% this year, to just over $251 million. However, most of that growth will come from an expanding footprint. Comps are projected to rise by a still-solid 4% to 5% in 2016. Panera Bread is targeting the same level of growth, while Chipotle's comps are trending sharply lower as it works through the negative press from last winter's E. coli, salmonella, and norovirus cases. Ideally, a fast-casual stock's comps will be greater than rivals (anything over 5% would qualify right now) and also improving over time. That way, you know the company is gaining market share while its locations are growing more efficient. Investors should also pay close attention to profitability. Since food and labor costs are higher than in the fast-food niche, fast-casual operators can struggle to exert sufficient pricing power to produce healthy profits. Chipotle remains the market leader on this score, though its operating margin has declined sharply and now just barely passes those of comparable companies. It's not likely these chains will produce anything approaching McDonald's 30% margin, but you should look for consistent profitability that's ideally climbing toward the double digits. Chipotle's plunge from market-darling status highlights some of the risks of investing in this young, high-growth space. Yet it has also helped push expectations lower for the entire industry, which can create opportunity for long-term investors who are bullish on this operating approach. Shake Shack, in particular, has seen its stock price sink by over 30% in the last year despite improving economics and steady sales-growth expectations. Comps and profitability metrics only tell part of the story for Shake Shack and its fast-casual peers. But the metrics provide a good starting point for investors seeking to gain exposure to this highly competitive, yet fast-growing, restaurant niche.